Ever since her mother died before Thanksgiving, Patches has been in hiding. She's been hiding in a destroyed couch in my library, a room that is now basically only a pass-through to the door that leads to the dog pen. A few days ago, she spent about 36 hours hiding in the bathtub. The last couple days, she hid behind some boxes under my desk in the library - when I found her there this morning, she was shaking from head to toe. During this whole time, she would come out to eat, but only eat about half of a can of canned dog food, and if I tried to pick her up she gave a small growl and let me know she might bite me. One of my motivators for getting a puppy was an attempt to bring Patches back into the world. She has always been a playful dog, so I was hoping she would play with the puppy - but, so far, she doesn't want anything to do with the puppy and even leaves her food bowl if the puppy looks at her sideways. 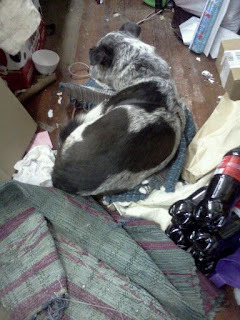 So, today, I begged Patches to come out from under the desk and was surprised when she came to me. I put a leash on her and led her out to the car - and then I realized how much I had been neglecting her - I used to take her with Blue and George in the car almost every day, but after Blue died, I had gone in the car alone or recently taken the new puppy - so, anyway, Patch was glad to be in the car - she went right away into the very back part where the sleeping bag and pillows are. She stayed in the car while I had lunch with friends, then I took her to the store. I had just gotten Patches settled at the store when a young girl opened the door and waved to the driver of their car to come in - and here's where the world becomes a funny place. The woman who came in had not been here for a dozen or more years - she moved to Illinois years ago. She is the person who rescued Patches when she was only a year old. I had sold Patches as a small puppy to a grandmother who had never let her out of the basement for a year. Neighbors were talking about how horrible the grandmother's house smelled and that's how I heard how badly Patches was being treated. One of my weaving students volunteered to go get Patches, and she did. She rescued Patches again a year later when she visited the dog pound and saw Patches being taken to the "euthanization" room. She stopped that process and called me and I, of course, was anxious to take Patches back. She arranged the adoption for me. We had not seen her since that phone call, and here she was today in the store. Patches jumped all over her. I saw Patches happy for the first time in weeks. Patches is about fifteen years old now, and hadn't seen her rescuer since she was a young dog, but she obviously remembered. Patches is better now, not hiding. She made a nest behind the counter at the store and has been acting like her old self all afternoon, even with lots of people in and out of the store. She even shared my supper with me. What a sweet, uplifting story! Thank you for sharing and my best wishes for Patches. I'm so glad Patches is feeling better. Thinking of Patches grieving so, hearing about the troubles of finding the right home and then "coming out of it"...I just want to give her a hug! Thank you for sharing Patches story. That is a heartwarming story Phyllis. I think you need to make time where it is just you and Patches as she probably feels as tho she is being replaced by the new dog. Funny that after all these years she would remember the rescuer.